1. So, here we are in a program called Beam Reach. Well beam reach is an actual point of sail! 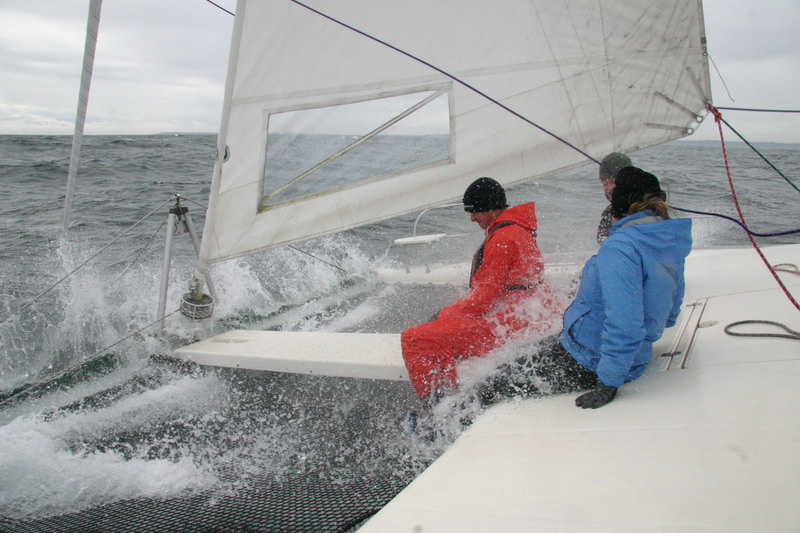 This is known as the fastest point of sail where the wind is perpendicular to the boat. Although it may be the fast and some people say it’s the “best sailing” but Todd doesn’t agree with that so we spend most of our time in a close reach, which is a zone, instead of a point of sail. I must admit I was rather excited to learn this! Here is a video Scott posted on the Beam Reach facebook page, that I was completely blown away by. This kite surfer is at the point of sail; beam reach. 2. Living on the Gato Verde we are considered part of the crew. We don’t sit back and relax while Todd does all the work. After he shows us how things work and what to do, we get a chance to try it ourselves. The best moment for me thus far would have to be hoisting the mainsail. I was really nervous before I started, but after that first pull I was into it. I got it most of the way up before my own body weight couldn’t pull the rope anymore and I had to wench it the rest of the way. It’s actually a full body work out too! There is always a sense of accomplishment after hoisting the mainsail, or even just helping with a tack, or chicken jibe. 3. While under sail Todd gives us each a turn at the helm. 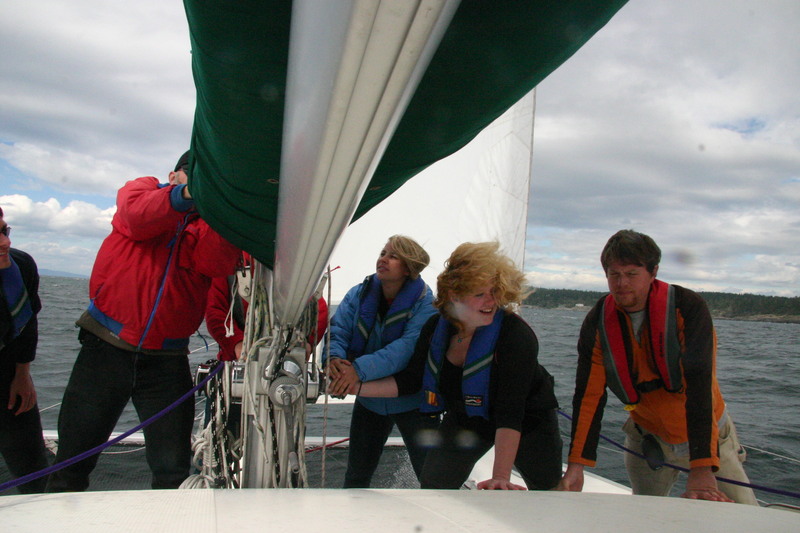 (Actually, the first time he let us take the helm was the very first day on the boat, talk about some real trust!) I’ll admit during my time at the helm, I’m rather nervous and stressed, there is so much to pay attention to, and if you move the wheel in the slightest bit, the boat really turns, and dodging the kelp really throws me off sometimes. But, once you get a hang of it, it is rather fun. 4. If the wind gets above 30 knots we have to stay in at anchor, but we have had a couple very windy, stormy days under 30 knots. On these days we bundle up in layers and waterproof gear and go sit out by the trampoline. It’s almost like being on the Disneyland ride, Splash Mountain, but so much better! The waves come breaking over the bow, up through the trampoline and we get covered in water. I feel like a little kid on my first rollercoaster! It brings laughter amongst the group, smiles, and a whole new type of joy. Hello from the Gato Verde! Things have been going great so far — it feels wonderful to be out on the water. I have not been sailing since 2008, and the moment I set foot on the Gato Verde, every reason for loving boats I had ever conjured in my mind came rushing back to me. I actually used to have a great fear of boats. I think it began because my idea of being out at sea was based on one or two childhood whale watching experiences. During one trip, I remember being so frightened that my mom had to literally sedate me with medication. I spent most of the whale watch underneath my Little Mermaid towel, hiding from the wrath of the Massachusetts seas. Despite my dramamine-induced drowsiness, I remember my panic reached a high point once we spotted whales. Every single passenger scrambled to one side of the boat to get a better look, causing us to tip precariously (at least in my mind). In this moment I remember feeling desperately out of control of my own fate…this boat was going to sink and there was nothing I could do to stop it. Luckily, my fear of boating has gradually been replaced by a deep love of all forms of marine transportation. This is the only instance where my fear of something has decreased as I have gotten older – all my other phobias have, unfortunately, seemed to increase with time. Thankfully, the time for fear of boats has passed in my life, and I couldn’t be happier to be sailing again. Everything has been working in our favor so far weather-wise (knock on wood), and things have been going very smoothly. I even got to steer the boat for about 20 minutes yesterday! After a relaxing first evening anchored in Griffin Bay, we rose early to get a head start on what we thought would be a very full day of sailing. 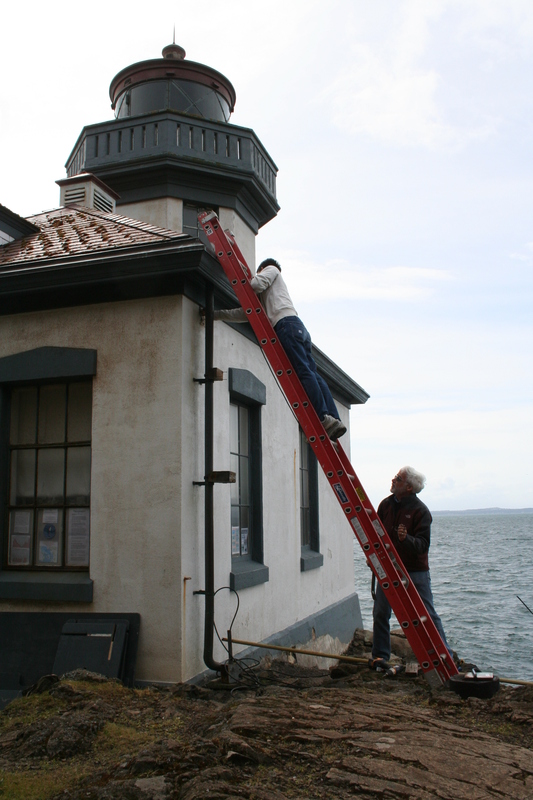 We had planned to sail to Neah Bay, where there is a hydrophone in need of repair. Beam Reach has never sailed that far, so we were all looking forward to the exciting challenge of charting new territory. I woke up early after a fitful night of sleep, soothed by early-morning fog banks and loon calls. We departed on schedule and enjoyed a leisurely breakfast. Around this time, I happened to look out the window; I had seen some sea lions sunning themselves on some rocks, and I thought I might see more in the water. Instead, I saw a tall black shape sinking beneath the surface. My breath caught. No, I thought, there is absolutely no way. It’s probably just a cormorant. Then, a blow. “Whales! 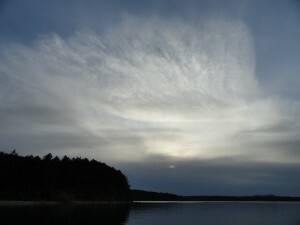 !” I cried, tripping over myself stupidly in an effort to get a better look. “Whales, whales!! !” I clapped happily, laughing in awe – I absolutely could not believe our luck. 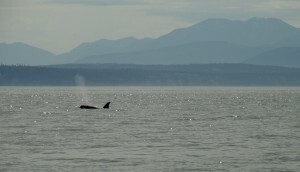 Here we are, one day out from Friday Harbor, and we happen to stumble upon a beautiful group of transient killer whales. Their pointed dorsal fins sliced through the water, and I sighed contentedly at hearing their piercing blows. 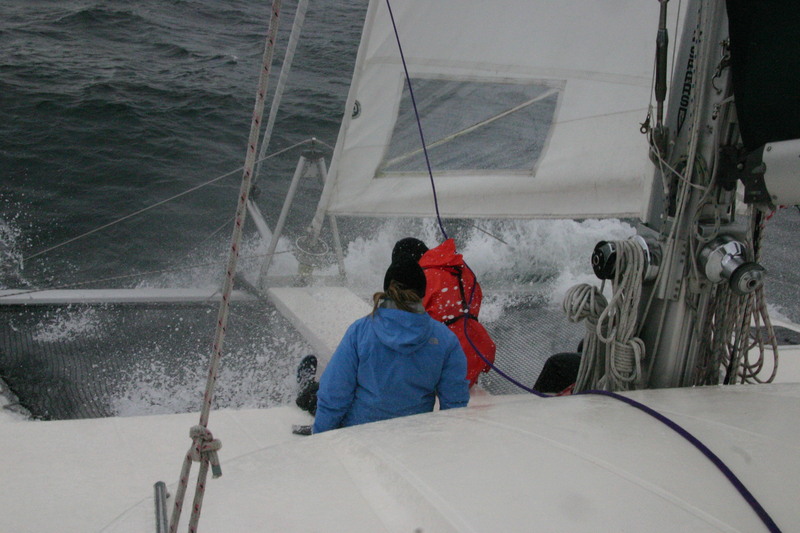 All plans of attempting a passage to Neah Bay lost, we followed the whales from nine in the morning until they gave us the slip around 3 pm. The whales came within meters of the Gato Verde several times; during one encounter I even picked up the familiar smell of whale breath on the air (which, in my opinion, smells like rotten pumpkins). I am happy to report that I recorded several videos of our time with the whales today…the quality, however, is somewhat compromised by the fact that I was leaping all over the boat in my uncontainable excitement. If these past two days have been any indication, there will be much more to report soon! There was not much that went on during this week, despite the lectures, advisory meetings, and work time. It was a week of work, to prepare for the following week which would be our first week in this program out at sea! We refined majority of our methods this week and figured out any group data that we would be able to collect to ease the process. We had talks about food consumption and how we can manage what we eat. I learned that being a meat eater that does not eat responsibly makes a huge impact, such as global warming, to our atmosphere. Localization of killer whales: now that lecture completely boggled my mind. Technology is so advanced these days that computers can estimate where a whale is located from a call produced. Vessel regulations were also gone over in our group discussion, regarding the conservation of southern resident killer whales. Logistically, this week has been a less stressful one, but there was a lot more information to take in compared to last week’s Steller sea lion incident. But, I cannot contain my excitement about sailing out of the labs. It will be a memorable experience to be able to go on a boat to conduct research. 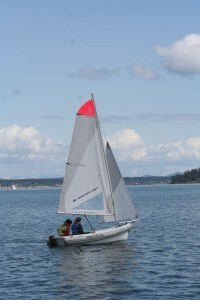 This first week, since the southern resident killer whales will not come up quite yet, we will be learning how to sail. 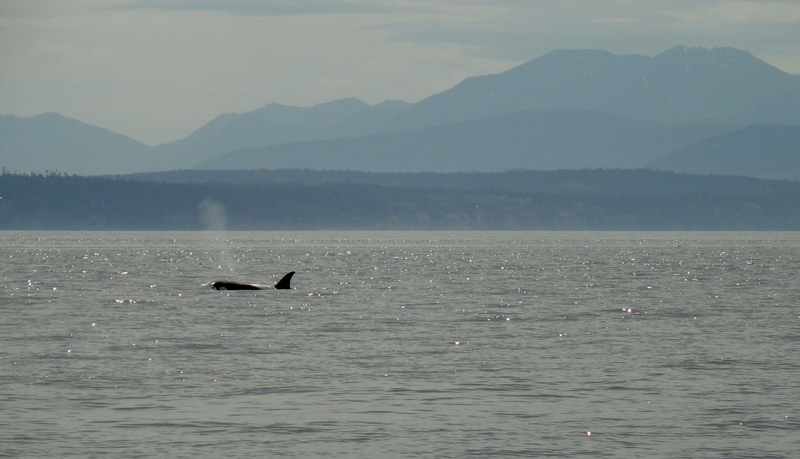 We did hear some transient killer whales off of the Port Townsend hydrophone network however, so I am anticipating on catching some with my eyes out there. Sailing has so many components that I have barely touched, since I come from living in a large city. Boat terms, ocean currents, knots, and other materials will be taught to us. I feel as though this sailing week will be a good one though, since it is a chance for us to bond in a smaller environment as a group. We get to work together, socialize, cook and clean together. That way, we all get to know each other better on a personal level and help each other when needed. 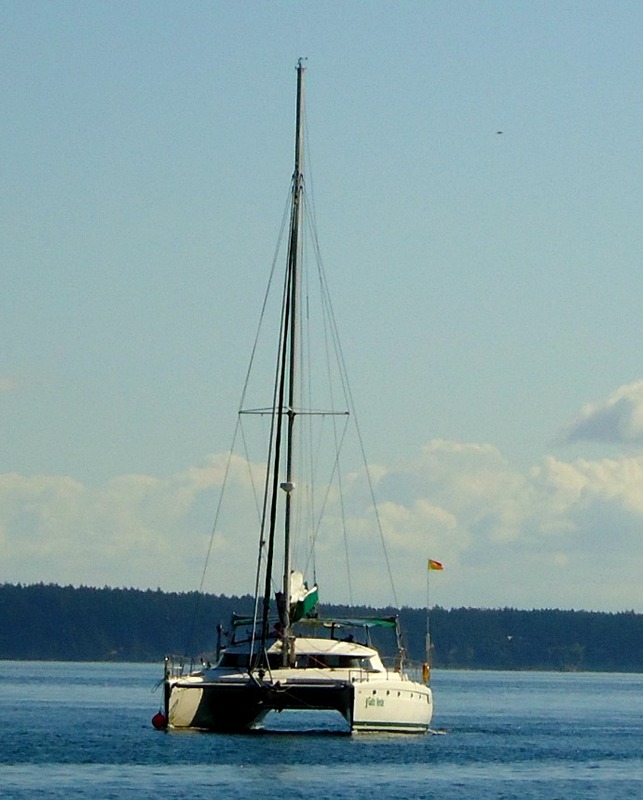 From what I have heard, the Gato Verde, the boat we will be boarding and sailing on, is a 42 foot long catamaran equipped with loads of bunkbeds, bathrooms, a galley, and decks for us to go out and observe nature. 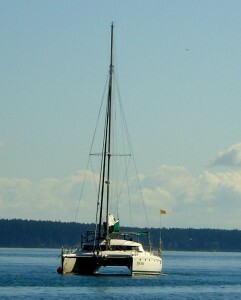 With such a large boat and so few of us, I will find all the upcoming sailing weeks a pleasure! Similar to what we did on Wednesday cooking granola together at S1, I feel we’ll have so much fun! 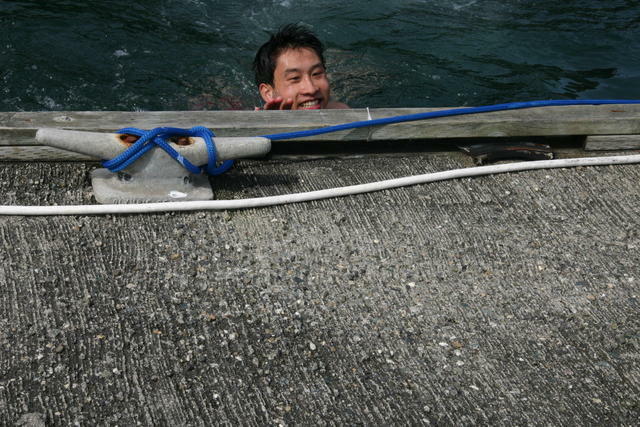 Lastly, before I end this blog, I just wanted to mention our Cold Plunge tradition of Beam Reach. 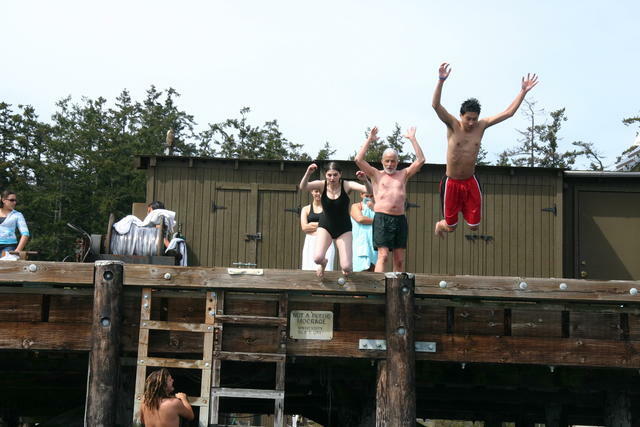 Every year, Beam Reach will require all students to jump into the waters by the dock to experience how cold the water actually is in the Pacific Northwest. Instructors follow along as well, and other students not in Beam Reach are always welcome to join. We had some students from the 3 Seas program join us this year and it was really fun. I finally got to experience the cold waters myself and I have got to say, when people say its cold, IT IS COLD. Nonetheless, I was awake for the rest of the day. You should definitely try it out. Sorry for the silence – between turning in a rough draft of our project proposals, participating in a Steller sea lion necropsy, and venturing out into the bay on our first sailing trip, we have been a bit short on free time. Even though this past week was somewhat of a whirlwind, I am truly in awe of how much information I absorbed. We had seminars on advanced acoustics, scoured the scientific literature for papers relating to our proposal topics, and got our first taste of boat life during excursions on the R/V Buzzard and Val’s dinghy. 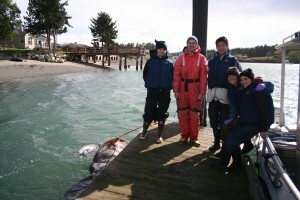 I learned how to hoist a 1-ton, male Steller sea lion out of the ocean amidst hail and wind, and I learned about its fascinating anatomy and physiology as I watched a marine mammal scientist conduct a necropsy. This was probably the most exciting part of our week (as evidenced by my fellow bloggers’ posts), and it was certainly a unique experience. When Jason approached us about picking up a dead sea lion on Lopez Island, I was dragging my feet, just trying to make it through the day after staying up late finishing my proposal. Almost instantaneously, my head felt lighter and my face lit up – the mere prospect of setting foot on any kind of boat was enough to lift my spirit. Since other blog posts have already chronicled the beginning of our sea lion adventure, I will keep this part of my blog post short. Suffice it to say that attempting to pull an animal the size of a couch into our little boat (during a hailstorm) was very interesting…as was trying to pull him out again after discovering he was too heavy to keep in the boat. 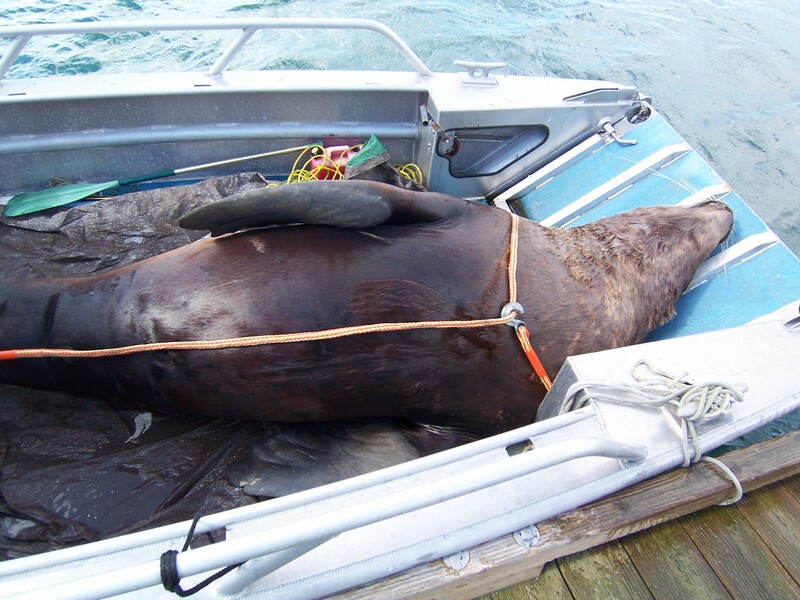 Several kind locals allowed us to tether the sea lion to their dock for the night with the understanding that we would be back early the next morning to retrieve him. Picking up the sea lion the next day was a much less trying experience than our initial retrieval operation; this time we had the weather on our side. 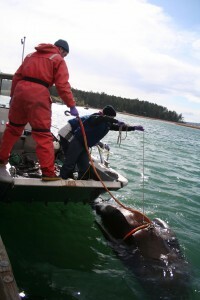 We tethered him to the side of the boat and started back (slowly) toward Friday Harbor Labs. As we rode back, I started to become uneasy about conducting a necropsy – wasn’t it disrespectful to mutilate this creature, even in “the name of science?” I had never spent so much time with an animal I was about to cut open, and I struggled to justify what we were about to do. The necropsy itself was, thankfully, a fairly subdued affair. It was clear that Joe, the veterinarian leading the dissection, wanted to be careful while still learning as much as he could about the animal. I very much enjoyed listening to his external monologue because it allowed me to follow his thought process. I didn’t feel uncomfortable at all until the very end of the necropsy when Joe decapitated the sea lion. After all we’d done to the animal, I had a hard time even watching him do it. I have always enjoyed necropsies, so long as I can separate the experience from the animal itself; holding this magnificent creature’s 30-pound head in my hands forced me to reconcile the fact that we had just marred the body of a once living thing. Despite my slight discomfort, I found the necropsy to be an extremely valuable learning experience – one I definitely never would have gotten in Maine! After a long Friday full of grimy work, we were rewarded with our first sailing trip. We went out in Val’s dinghy, two at a time, and tried our hands at working with the wind to propel ourselves around the bay. It was difficult, but we had a lot of fun! This experience made me realize that I am absolutely itching to get out to sea – one of my major life goals is to become an able-bodied sailor (I would love to get my captain’s license someday). In a continuing boating theme, Horace, Nora, and I decided to row into town on Saturday since it was such a calm, sunny day. I had never rowed before, so I was nervous about how I would do. I ended up rowing back to the labs with Nora, and I unfortunately didn’t do as well as I would have liked. 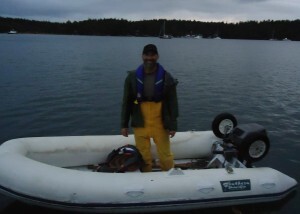 I plan to practice, though, and I am hoping to be an expert rower by the time I leave San Juan Island! 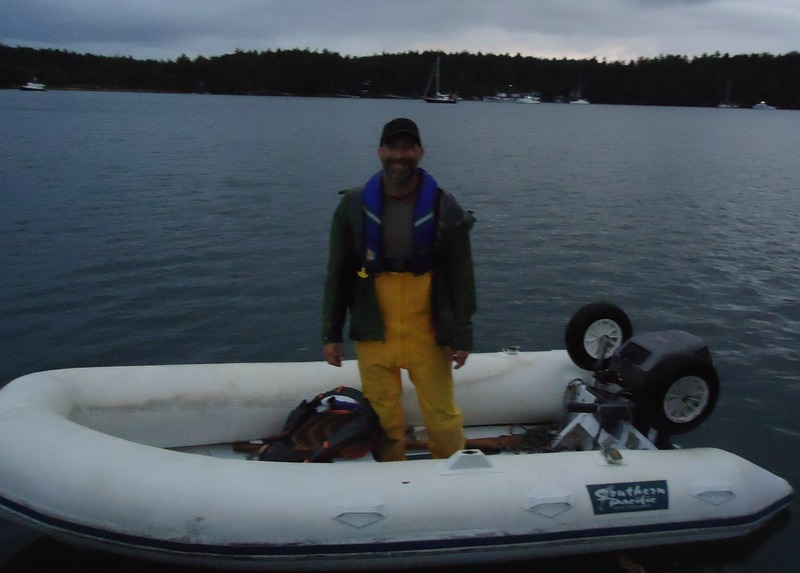 Overall, things have been going pretty well here at FHL – I am definitely ready to get out on the water. The whales have yet to make their debut around these parts, so I am keen to get out there and start looking for them myself!